Hey guys….let’s talk for a minute. We want to let you in on a little female “intel”. Your lady may not like the same dozen rose arrangement in a clear vase that her mom got for Valentine’s Day. She’s a modern woman and knows what she likes. With so many more options available to her and after watching shows like Fixer Upper and spending hours on Pinterest, we think she might want something different. We are hoping you’ll think outside the box too; it’s a new day and her taste is different than those ladies in the past. 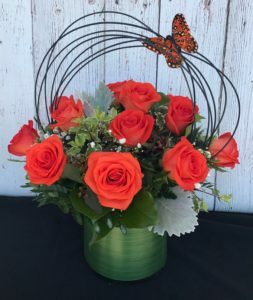 While a dozen roses are beautiful and classic, she’s sure to love our contemporary dozen, It’s a statement maker!! She may also love something unique like our Cupid Fashionista, which is a customer favorite dressed up for Valentines day! . 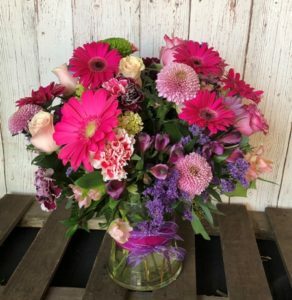 If she works with lots of ladies, she’d love to make them all envious of her Showstopper arrangement. You choose the rose color and our amazing designers will make a bouquet that will amaze. 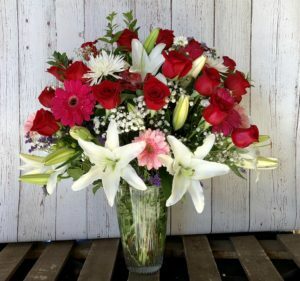 We will use Oriental Lilies, and a beautiful mix of accentuating flowers for the color of roses you choose, Like it’s name, this one will impress! True, you could give her the classic dozen roses but then you might just get an “I love you” and not much more in return.